This colorful, flavorful Provolone and Roasted Bell Pepper Spread is delicious on toasted baguette. Use all one color bell pepper or mix it up with red, orange and yellow for an eye-appealing presentation. Green bell peppers are a little bitter, the basil adds a punch of green. 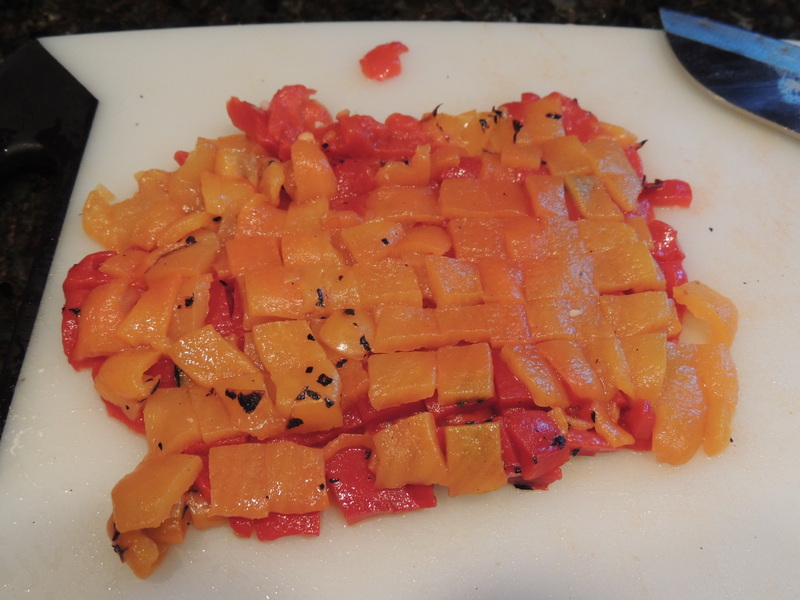 Make the roasted bell peppers yourself or used jarred roasted peppers; be sure to dry them well before chopping. Combine the peppers, cheese, basil, garlic, olive oil, vinegar, salt and pepper in a small bowl. Stir to combine and garnish with the basil sprig. To serve place the bowl on a large plate and surround the bowl with the toasted bread or top each bread with the pepper mixture and serve on a platter. Watch the Provolone and Roasted Bell Pepper Spread here. Rub the peppers sparingly with oil. Lie the peppers, cut side down, on a sheet tray. Bake in the preheated oven for 20 minutes. Cover with a dish towel and steam for 10 minutes. Remove the charred skin and seeds; follow recipe below. Combine the peppers, cheese, garlic olive oil, vinegar, salt and pepper in a small serving bowl. Garnish with the top of a basil sprig. To serve on individual toasted baguette, plate just before serving or the bread becomes soggy. 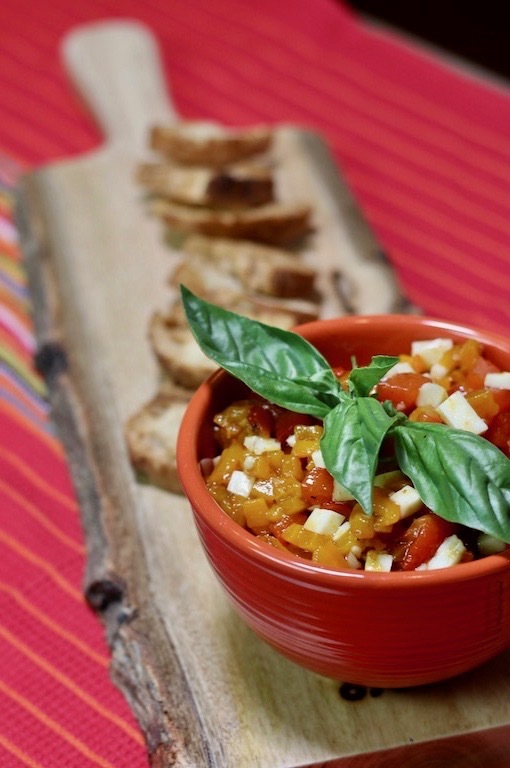 This colorful, flavorful Provolone and Roasted Bell Pepper Spread is perfect on toasted bread. Use all one color bell pepper or mix it up with red, orange and yellow. Green pepper is a little bitter for this recipe and the basil adds a punch of green. Place the bread slices on a cookie tray and brush with olive oil. Bake for 15 minutes or until lightly browned. Remove and cool. Store in an airtight container if not using immediately. 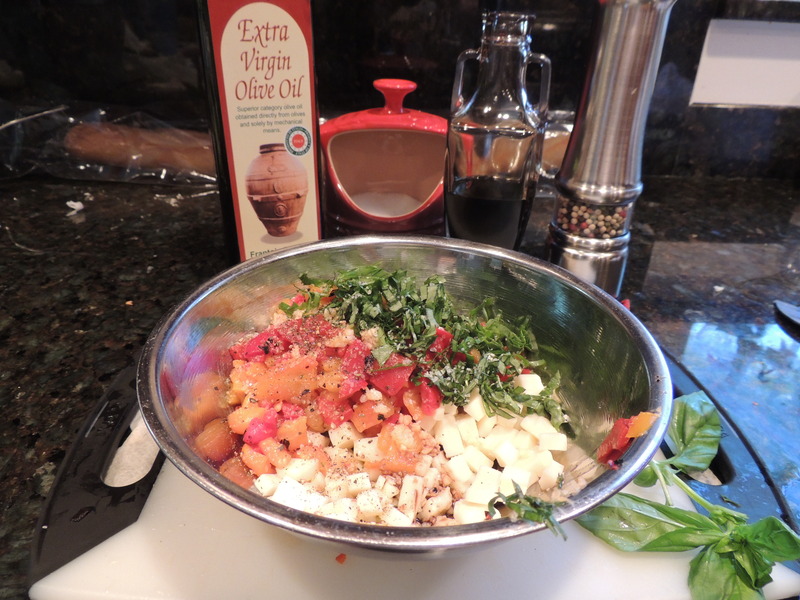 Meanwhile, combine the peppers, cheese, basil, garlic, olive oil, vinegar, salt and pepper in a small bowl. Stir to combine and garnish with the basil sprig. Don’t hesitate to use jarred peppers, just pat them dry before dicing.